After our great two weeks of helping on the Finca it was time to start moving again. It was a little strange not driving the mog for two weeks so our feet were getting itchy, places to go, places to see, oh so many of them here in South America. Aconcagua is one of the country’s (in Argentina) most well-known parks as it contains one of the world’s highest summits and at 6,962 meters it is the goal of many novice mountaineers, by the way we didn’t tackle it, as we were a little late for the climbing season, as the best time for doing this is from end of December to February. Phew lucky us !! Apparently the north face is relatively easy to climb, once you are of good physical condition, but I gather the south face is virtually impossible and only with guides. We slept overnight in the Parks car park which meant that we had the most spectacular view of the mountain as soon as the first bit of sun hit it. This we could see from our truck, without even having to get out. Once it was bright , and a little less cold, once the sun. arrived, we did a three-hour hike to see this fabulous mountain silhouetted against the clear blue sky. There was only the two of us in this entire park, the silence was golden, and this was not interrupted until about 11.oo am when we spotted some day trippers. 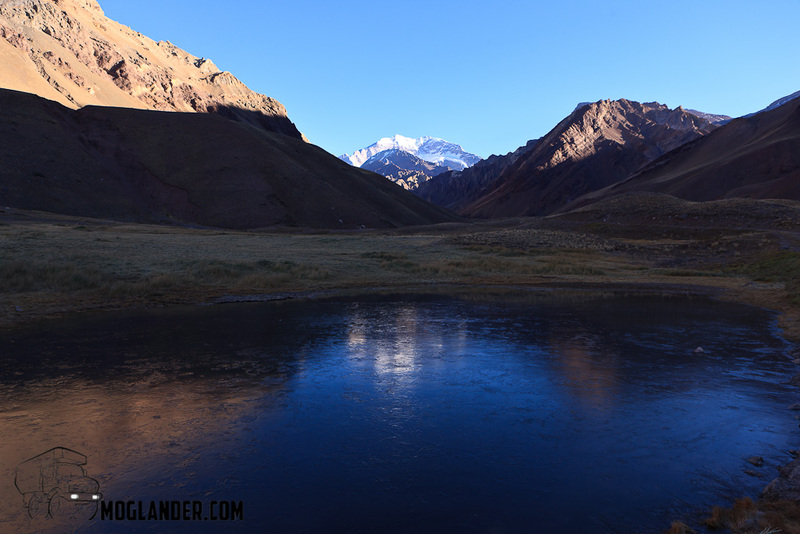 Unlike many national parks, Aconcagua has relatively little to offer other than its wonderful scenery . 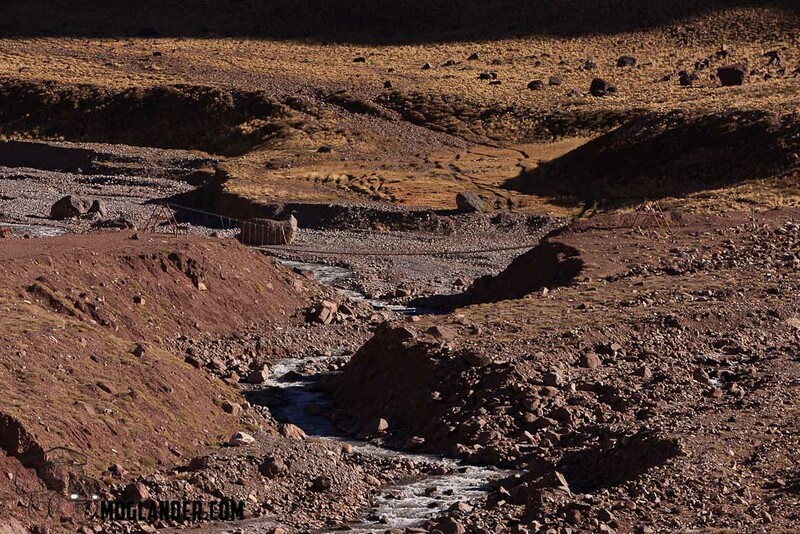 This is one of the Andes’s most barren sectors, with little vegetation and few mammals. 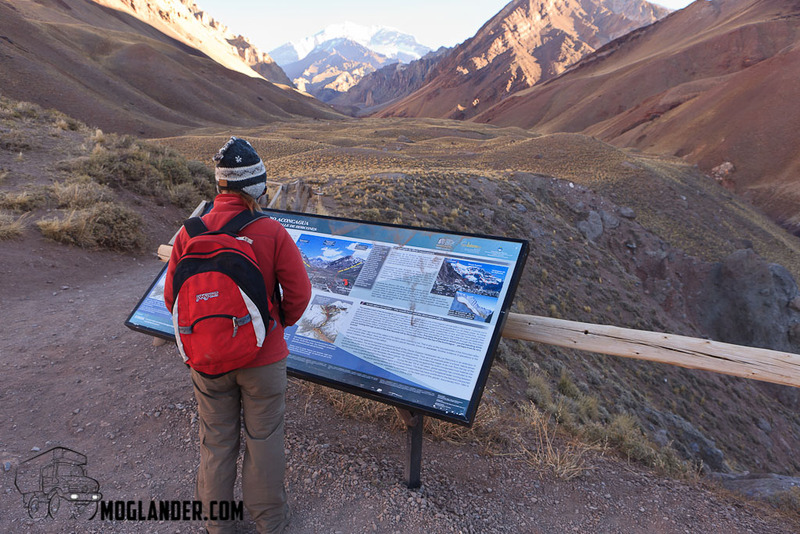 We were lucky to spot the Andean condor, which came close to extinction due to hunting. 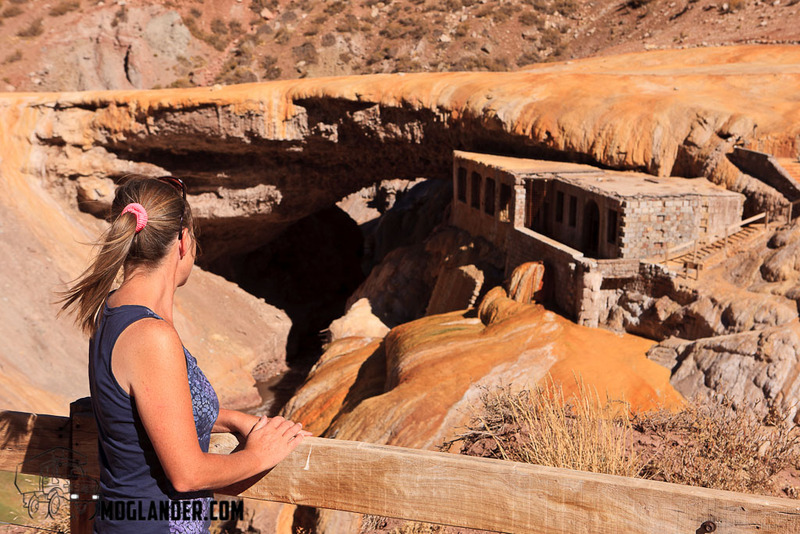 Close to here we also visited Puente del Inca which is a natural bridge formed by sulpher bearing hot springs. There once was hot thermal baths just under the bridge, now dilapidated , but they were believed to be really good for medical treatments. 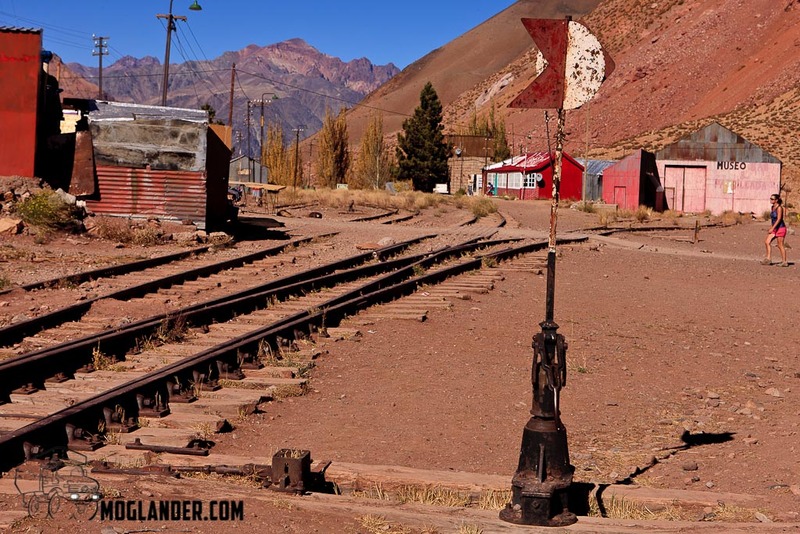 Also here there used to be a hotel, sadly now in ruins too but just image the scenery as you soaked, the Andean Valleys and Aconcagua, what more could you ask for? Sarah looking at the old building under the natural bridge. You can no longer cross the bridge due to cracks, which are due to the lack of water running over it. 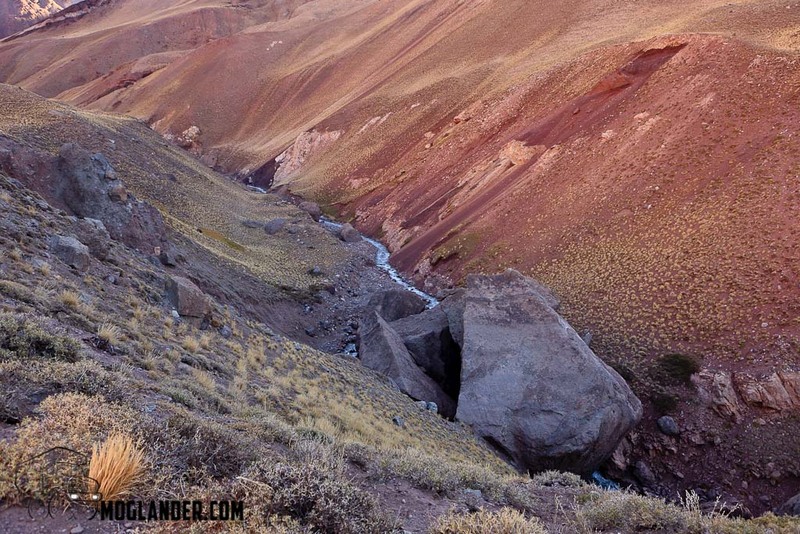 We then said good-bye to Argentina , and crossed into Chile again , and we are about 2 hours north of Santiago.